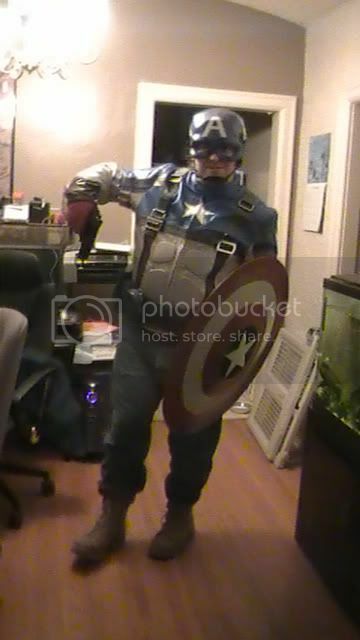 Discussion in 'Marvel Costumes and Props' started by keegano, Oct 19, 2011. 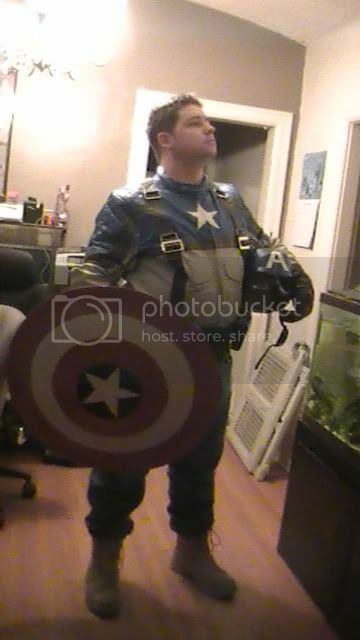 Hey, new member here with my Captain America project. Here is the helmet process. 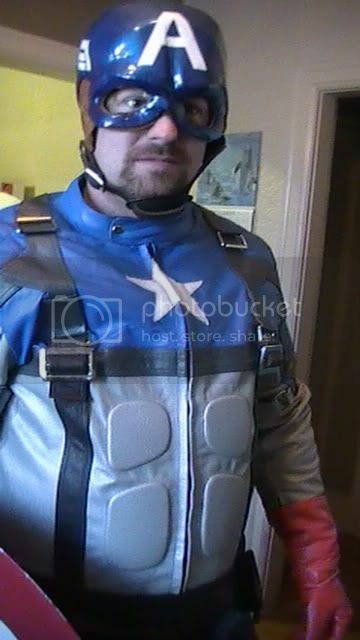 I purchased a Cap vinyl mask and thought it looks pretty cool, but I thought I would take a swing at the movie helmet. I have to say, this was a rather ambitious project for a newcomer but I thought it came out ok. Now that I'm done with the helmet, I have learned numerous things about the process of building pep projects. I'm sure my next one will come out better. Please let me know what you guys think, and tell me I get a stamp of approval. The shiney blue is a better idea of the color that it is. The finished helmet pics are the same color, just taken in a different location with a different camera. 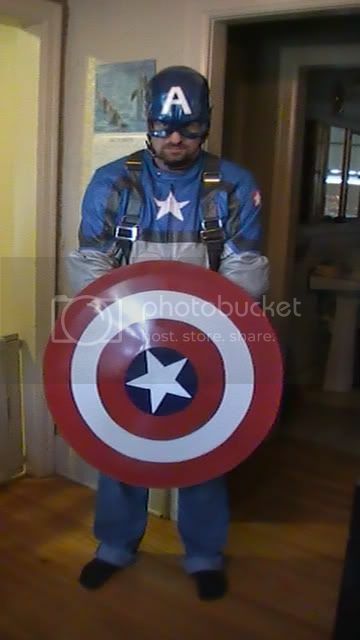 Here is the jacket, helmet, belt (I guess you can't quite see it in these ones), and shield together. The gloves are out and I'm going with a more "practical" pair. 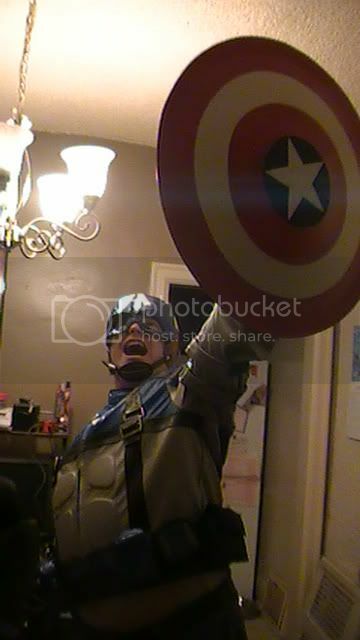 I'll post pics of the whole suit once I can get someone to take them. Hmmm, hoped someone would have a comment. Let me guess, it's the brown straps on the jacket? Hope to get some pics of the full suit up in a couple days. 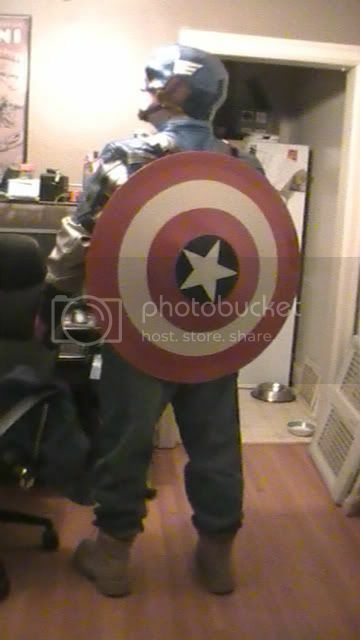 By the way, that shield is stainless steel and tough as nails. The handle was welded on the back unfortunately but still cool enough for the $60 or whatever it cost my parent's at the local knife shop. I was thinking of sanding it down and riveting a couple handles then a whole new paint job. Then again, since it was a gift, I think I may be expected to leave it as is. all you need are some wooshing comic-esque lines photoshopped in. 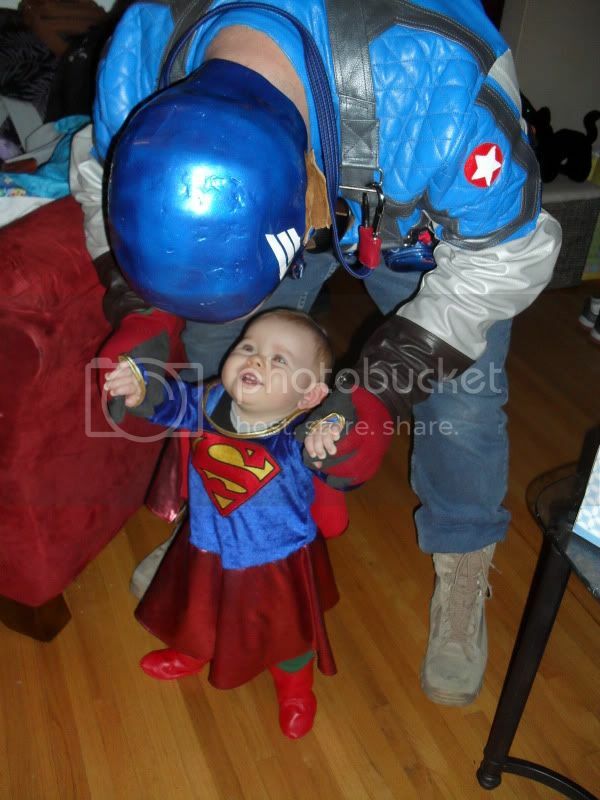 Dude, it was your tutorial I used to make that helmet. Thanks for the inspiration. Guess I should have smoothed it out better before painting, oh well. Maybe I'll touch it up later. It comes with practice. I guarantee your next project will top that one. It wasn't really the sanding though. The pepped part itself had a lot of divets in it and you resined it before fixing those. Remember that for next time. I definately should have used some sort of filler putty. I went from bondo to a spray filler primer.What product do you use to fill divets and what not after bondo? I also see why you use spray adhesive and fibreglss cloth. They didn't have spray adhesive in stock when I went to the store and I was too impulsive to make sure I found it. I also bought a fibreglass resin kit that came with fibreglass matte (thinking I could cut costs). I ended up having to coat the pieces of fibreglass in the resin, wring them out, then attempt to put them inside. That process ended up using an entire 1 litre jug of resin, so obviously no money saved since I'm sure it would have been enough resin for many projects. Oh well, it is a learning process. Now I have to buy heaters for my garage so I can continue to work on this hobby over the cold Saskatchewan winter. 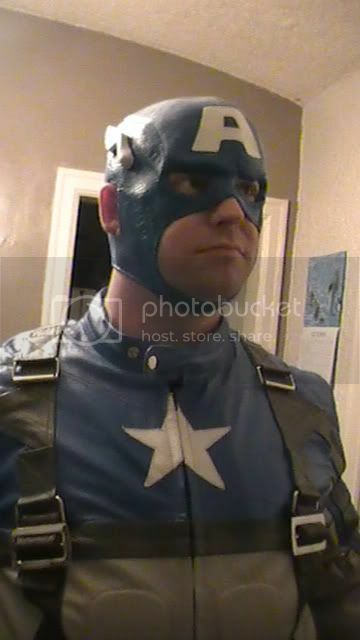 Here's a few more pics of my cap costume. 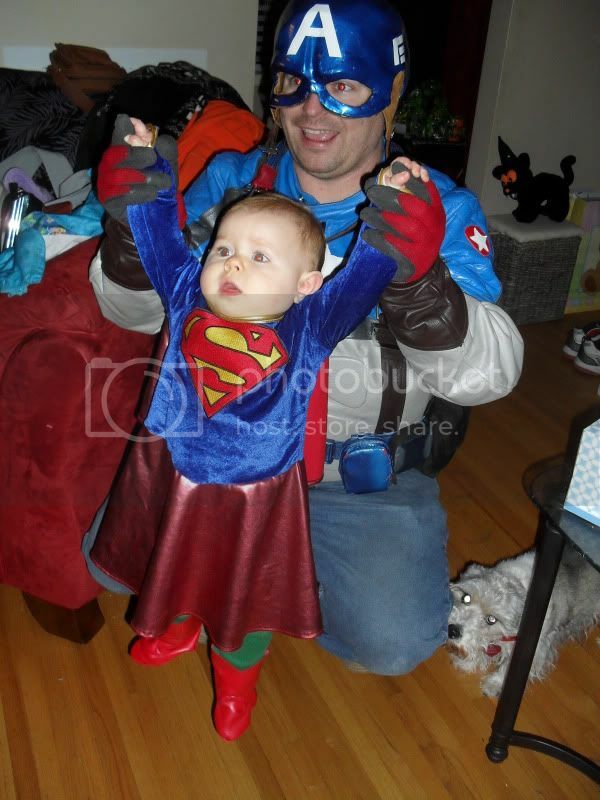 Took a couple with my daughter in the Supergirl costume I bought her. 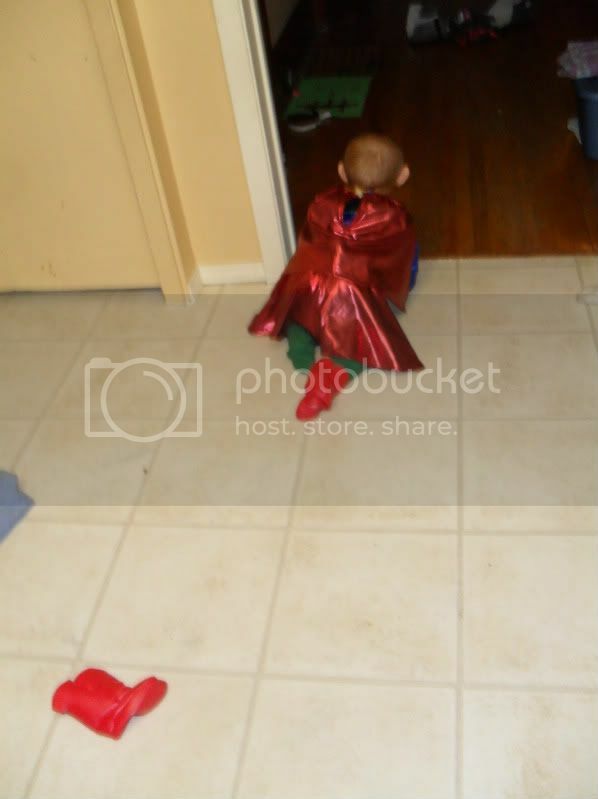 I took the red vinyl gloves that I bought for my Cap costume and turned them into boots for my Superbaby. I didn't like the way they fit, so I used different ones. It was my first time making boots. They didn't want to stay on that well. Maybe I should have put some straps on them. 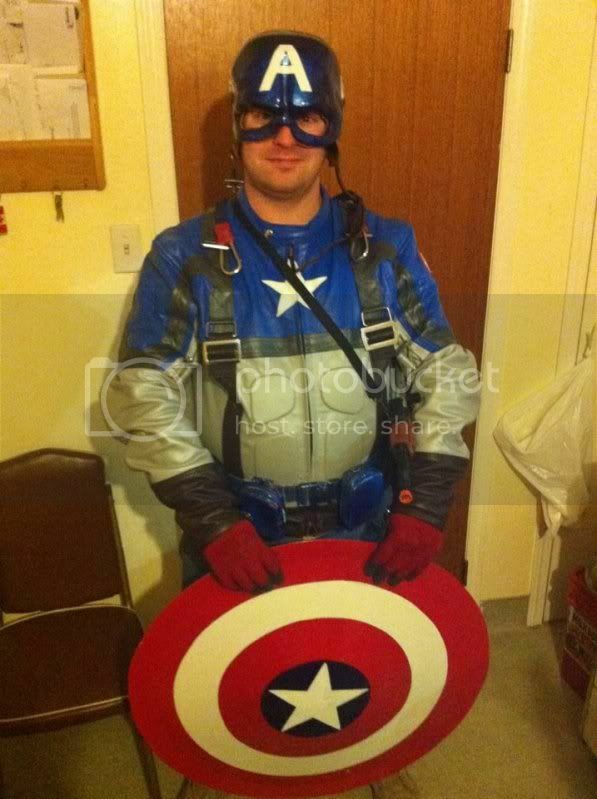 By the way, I won both costume contests I went in this year. 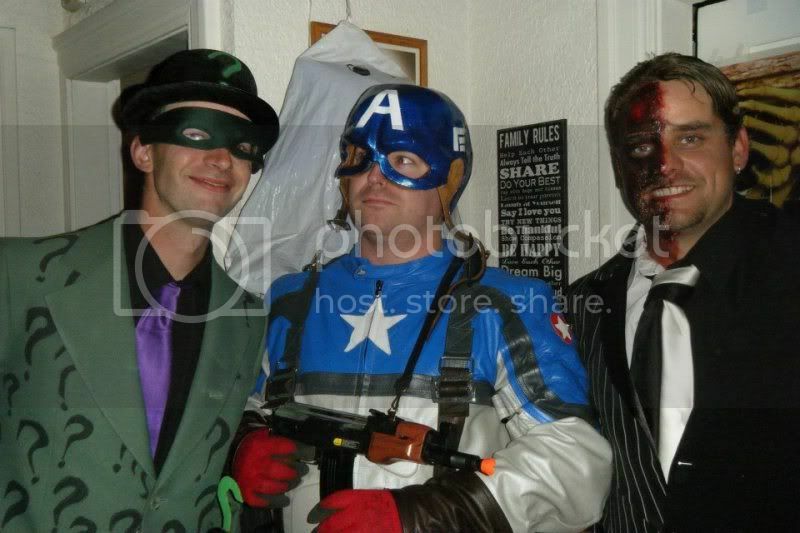 Most creative costume from my friends after they saw my progress of what it took to create that helmet. At the bar they just said "if you won the superhero costume contest, come claim your prize" and apparently i was just supposed to know that I won. Hooray for a $20 gift certificate for a tanning and spa place. Maybe I can regift it for Christmas. At least I won a drinking/tiddly winks/golf game from my friends. Very nice job! I hope my first helmet comes out that good. Grats on winning the contest.